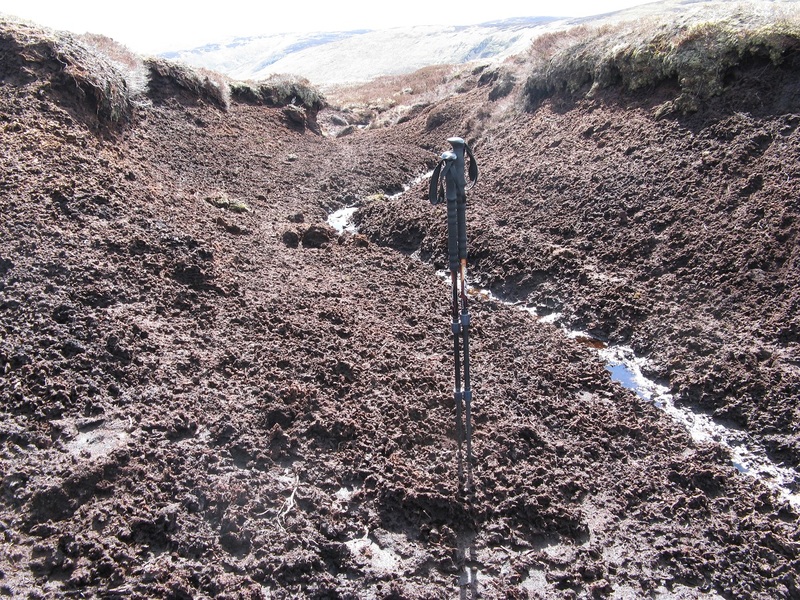 Before that however there was the little matter of finding my last five days food which I’d hidden over a month earlier near Baddoch Burn over 20 km east of Glen Tilt. And to get there I first needed to find a place to cross the river. 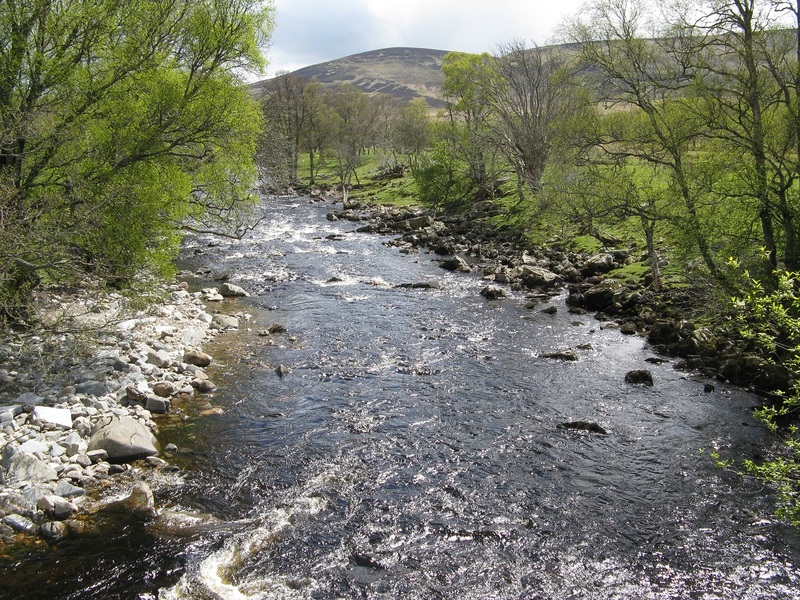 Some day I’ll have to go back and walk the upper reaches of Glen Tilt, but on this occassion the plan was to cross somewhere above the Falls of Tarf and head east. My food was down to a bag of trail mix, some oatcakes and a couple of sachets of porridge. 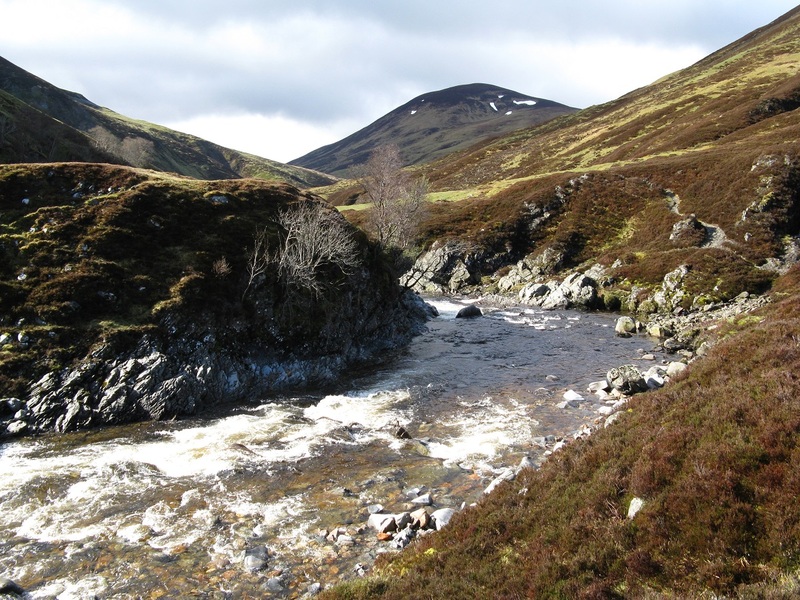 A days walk away was five days of food stashed in an old water tank by Baddoch Burn. 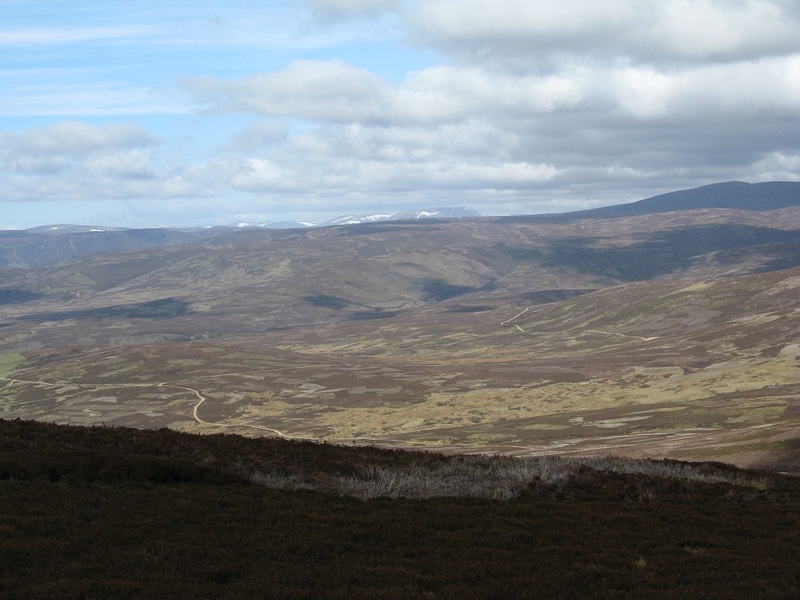 If I couldn’t get across the Tilt the rats would be welcome to it and I’d have to head all the way around to Braemar. All the way up the Glen so far the River Tilt had looked completely unfordable and the worry was growing. 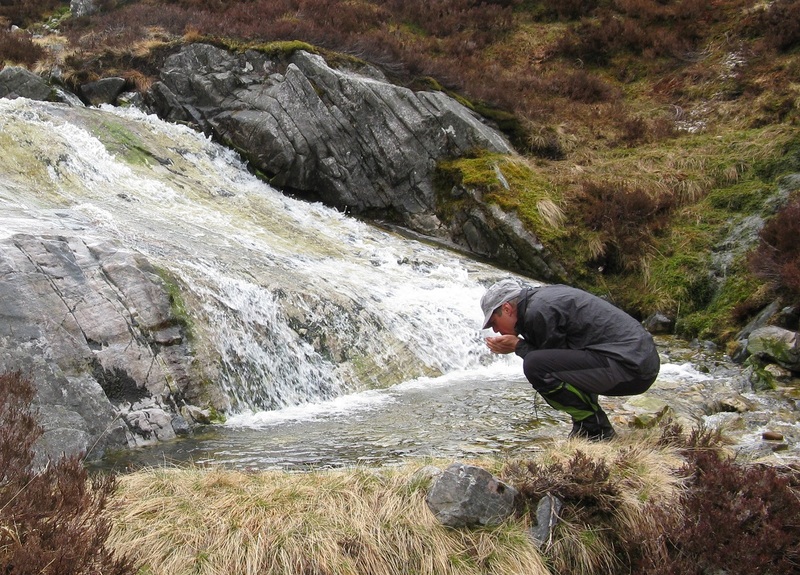 Each tributary stream I crossed as I walked upstream removed a mere trickle from the main flow. With great relief, it turned out that a great deal of the flow comes in via Tarf Water which is crossed by a bridge in front of the falls. Beyond the falls what’s left of the flow coming down from Loch Tilt is much reduced and looked easily fordable. In fact no less that 100 yards north of the falls the flow splits again, leaving me only having to tip toe over a pitiful stream to the other side. Far from having to wade chest deep in a raging torrent, I didn’t even have to get the soles of my boots wet. One thing that never fails to throw me when I’m backpacking in Scotland using 1:50,000 maps is the sheer scale of everything. Those of us who live south of the border and spend our lives walking along to the rhythm of a 1:25,000 get accustomed to seeing the world in this scale. When I planned my TGO route I’d formed a mental picture of what each stage might look like, but my Yorkshire eye’s had deceived me. Everything is much bigger on the ground, much further than you imagine it will be. Now, 10 days into the trek I think my mind had adjusted to the new scale and I could read the distances and judge time and effort needed more accurately. 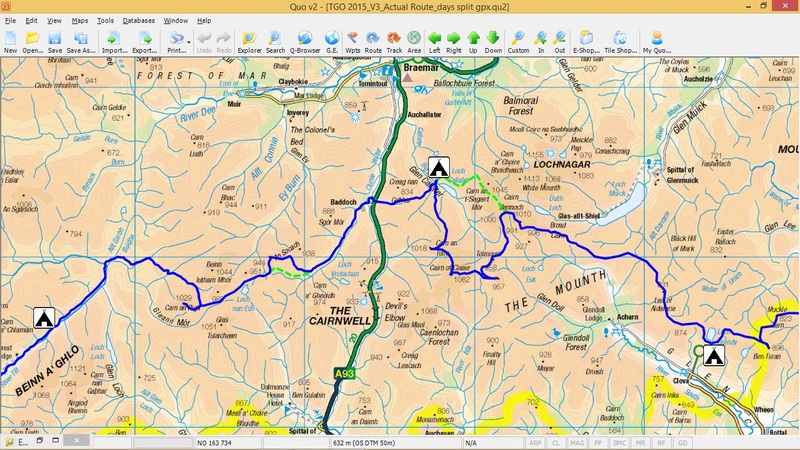 Looking at the route ahead I could see I was going to have energy to spare, energy perhaps to squeeze in another Munro. Of course maps themselves can deceive you, and in the case of OS Sheet 43 it throws you by showing an entire forest that doesn’t in fact exist on the ground. Once across the Tilt you climb slightly and then a path is supposed to skirt the southern edge of a plantation on the way across to Fealar Lodge. The fence line is certainly there, but the trees have never been planted, it’s just open moorland. 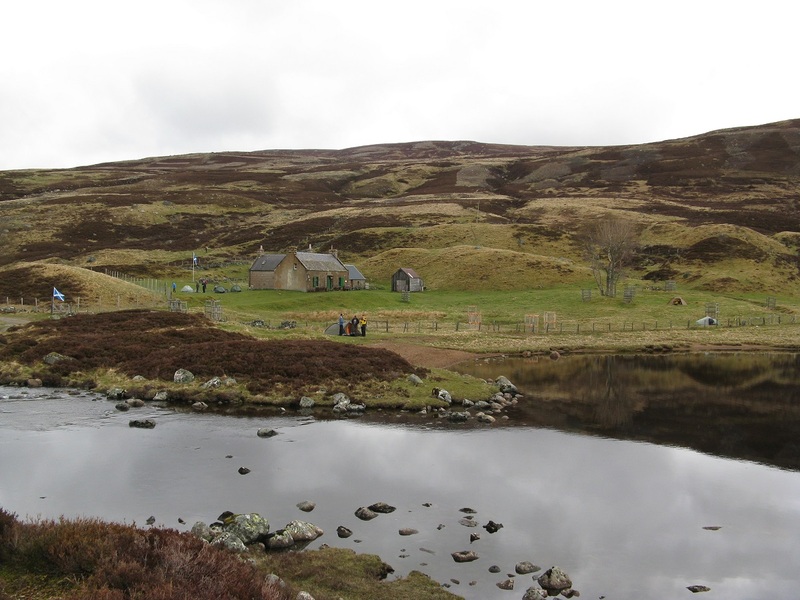 Fealar Lodge itself comes as a surprise, like a Scottish Little House on the Prairie….painted pink. I’ve read somewhere that it’s the most remote settlement in Scotland, probably not true but it does feel incredibly isolated. Looking through the window of the white building on the right as I passed I could see it was full of bunks. Whether it was once a bunk barn or bothy I’m not certain, but if anybody knows I’d love to hear. From Fealar Lodge it’s easy going on an increasingly faint path climbing steadily to a boggy bealach between two munros, Mam nan Carn and Carn an Righ. From a distance the latter had looked pretty cold on top and an awful long way off, but after a quick drink below the bealach it looked so close on the map I decided to pop up to the top. Dropping my pack at the bealach, it only took 25 minutes up to the top and back. This was all coming too easily, though I’ll admit the reason I got up and down so quick was that the weather clagged in and started hailing heavily and I’d not put any layers on. From the top I pretty much jogged back down to my pack to put on a fleece. From Carn an Righ there’s a lovely path which skirts high along the hillside to the wonderfully remote Loch nan Eun, though the path pretty much dissolves into a mass of peat hags as you approach the loch. 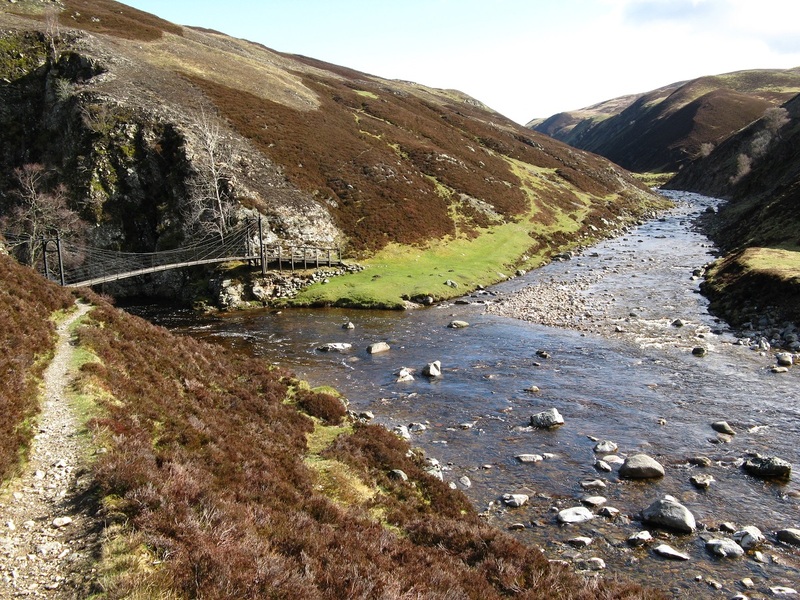 The ground around the shore seems to take forever to cross, and once at the other end you can see it the hags go on for miles across towards the top of Baddoch Burn. As you’re crossing here, the scree ridden end of An Socach rises in the distance, enticing you across to another munro. Part way across I bumped into Ali Ogden from Newtonmore Hostel, the first challenger I’d met since leaving Glen Coe 6 days earlier. I left Ali to continue weaving in an around the peat hags and diverted my route yet again to clamber up the west end of An Socach. This one came even easier than Carn an Righ though it’s pretty steep and very lose ascending up this way, and once you’re on top I realised how much the wind had increased. 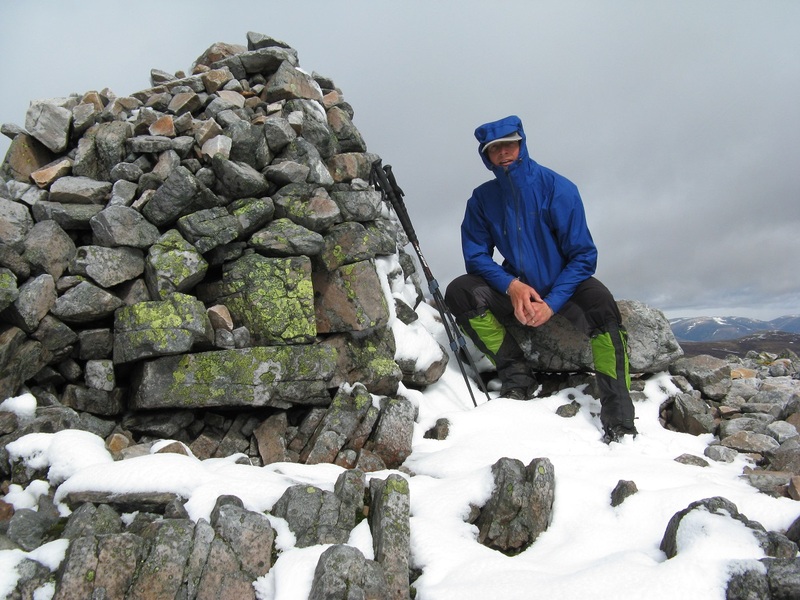 I must have spent all of 30 seconds on top huddled in the low walled shelter, just long enough to get a shell and gloves on before I was engulfed yet again in hail and sleet. 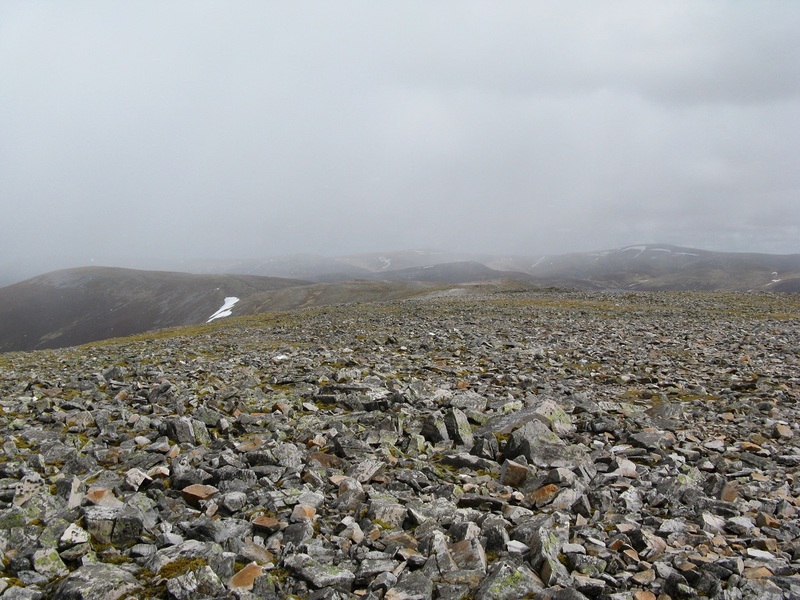 It’s flat as the proverbial pancake up there and extremely rocky, probably for 3 km east along the summit plateau, not the place to be in a biting wind carrying snow flurries. Rather than walk all the way along the top I dropped back down about half way descending down to meet again with Baddoch Burn, catching up with Ali on the track down the glen. Down of the tops it was all blue skies and sunshine, just the munros getting the brunt of it. I tagged with Ali for the rest of the day, the first person I’d walked with since leaving Lochailort on the west coast; it was great to have some company at last. And somewhere down here was a food parcel with my name on it. I’d piled that many rocks on it when I’d left it a month earlier that a hungry wart hog wouldn’t have been able to disturb it. And sure enough it was in one piece and still where I’d left it. Initial joy at having so much food soon turned to groans though after I’d managed to shoe horn it into my pack and the weight felt like it was going to tear the shoulder straps off. My master plan had been to camp here by the burn, eat a good bit of the weight here and carry on with one days less food next day. But it was too early, barely 3 pm. Ali was carrying on to Lochcallater Lodge for the night. A few more miles may give me a few more options for the next days route, so I tagged along further. 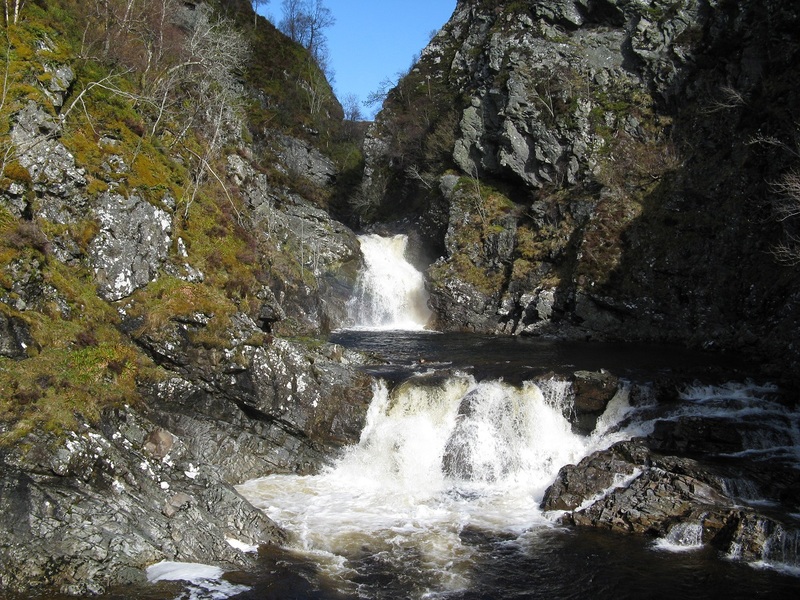 Once across the A93 there’s a fantastic little path which climbs over to Lochcallater between Creag nan Gabhar and Creag an t-Sean-ruigh, following a beautiful cascading stream. In the afternoon sun it was picture perfect for an afternoon dip, but I resisted. A wash would have to wait another couple of days. By the time we reached Lochcallater Lodge only an hour later the weather had taken a change for the worst, the sun gone and the rain had returned. A good crowd of challengers were already entrenched in the kitchen and around the fireplace,with a fair few tents flapping in the wind outside. 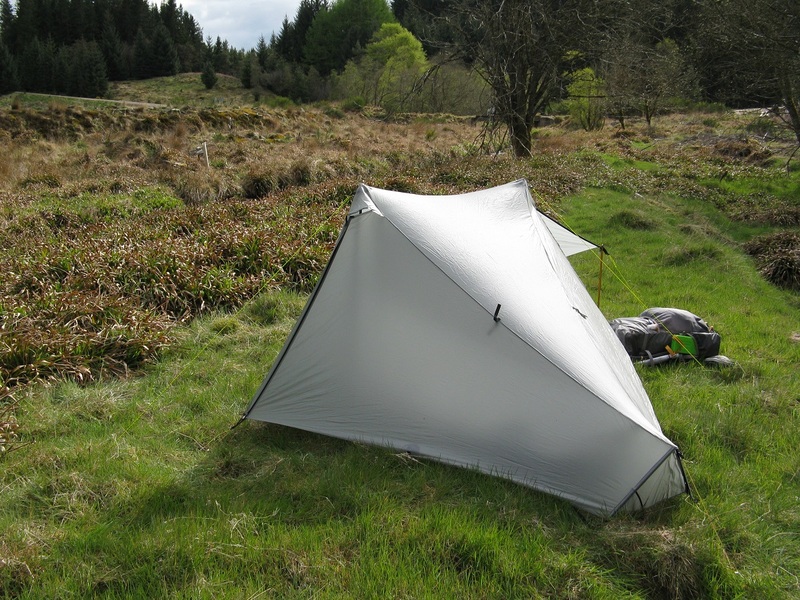 I enjoyed a huge mug of tea and a whisky courtesy of Dennis Pigeon, then pitched just far enough away to avoid inebriated legs tripping over my tent. And I feel as though I should apologise if I appeared anti-social that evening, especially as when I popped out for a call of nature at 4 am the lights were still on in the lodge and laughter still reverberating from inside. If truth be told I was slowly getting enticed by the large pot of chilly cooking in the kitchen that evening, then remembered the 5 days of food I’d just picked up in Baddoch. If I hadn’t sneaked back to my tent and eaten until I was bursting I’d be carrying it to the coast. After the two unscheduled munros the previous day things rather ran away with me. Ali had mentioned that once you’re up on the tops from here it’s easy to take in 6 munros rather than just the two I’d planned. It would add about 6 km to the days walk, but I was ahead anyway. By time I’d packed I’d decided to give it a go, the weather looked pretty good. Well that weather lasted about 30 minutes, just long enough to be committed, then it started to snow. 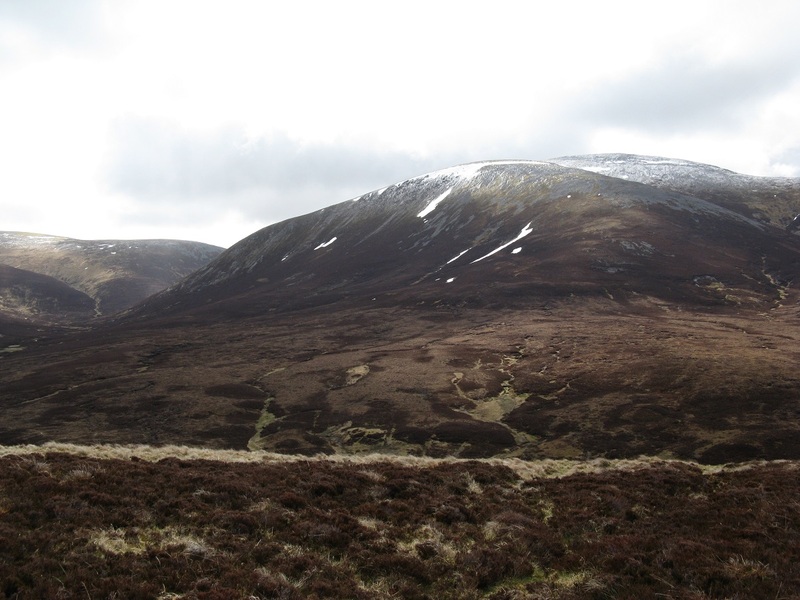 Rather than head up directly towards Cairn Bannoch and Broad Cairn, I diverted to take in Cairn an Tuirc and the other munros around the head of Glen Callater. 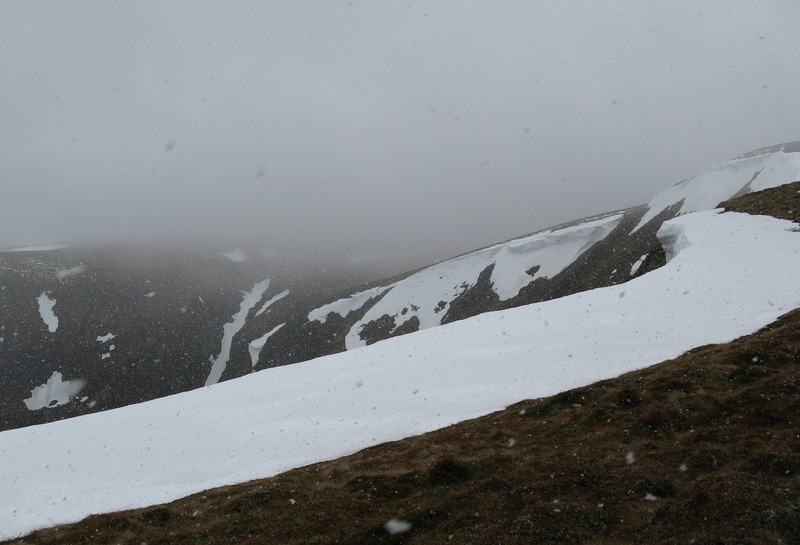 It started to snow ascending Cairn an Tuirc and by the time I got near the top, visibility was almost nil. In fact almost all the way across this and the subsequent two munros, Cairn of Claise and Tom Buidhe, I was on bearings all the way. Thankfully the wind was light so it wasn’t particularly cold. 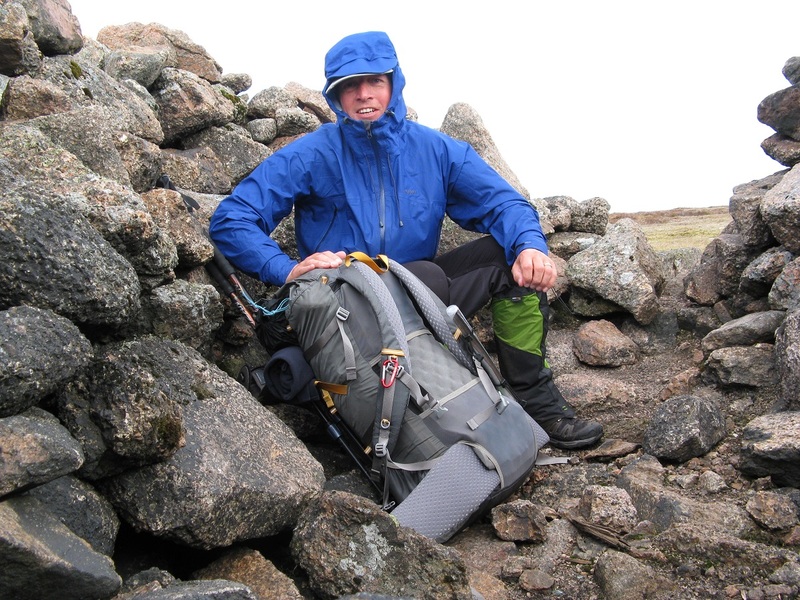 On Cairn of Claise I bumped into Colin Crawford, who’d vetted my route. I bumped into him again coming off Tom Buidhe and tagged along over the next, Tolmount. 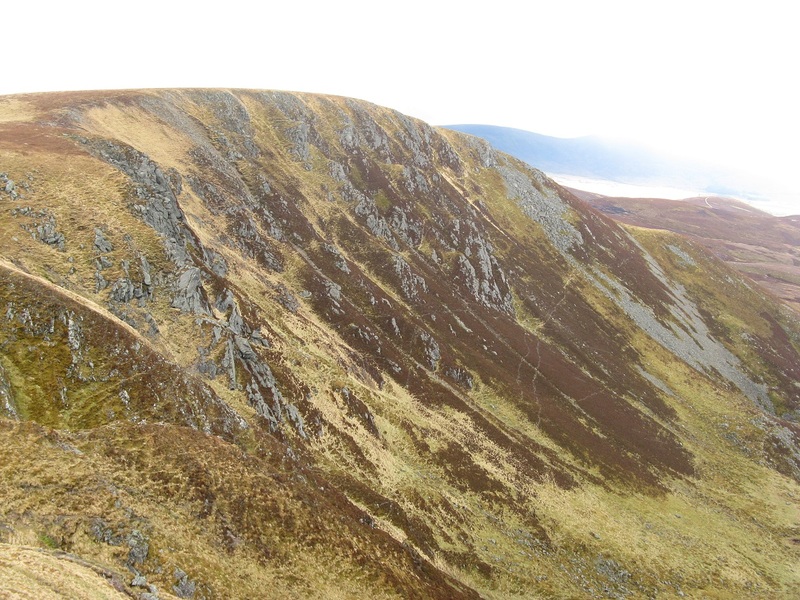 Ali was right, once you’re up here you simply romp over these munros. It was just such a shame that I hardly got any views at all. From Tolmount I left Colin to trek across directly to Broad Cairn while I diverted off to take in Feferrnie, Cairn Bannoch and Cairn of Gowal on the way round. 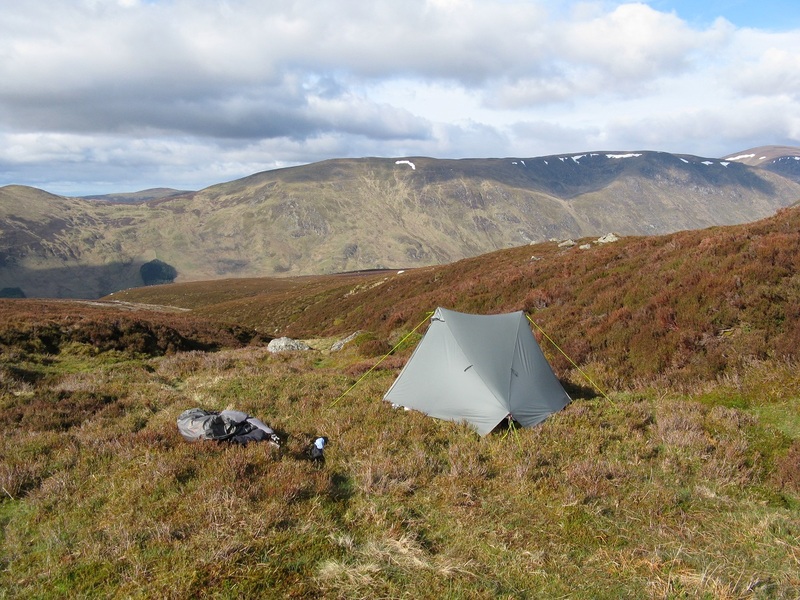 Colin was planning a shorter day with an early camp down towards Dubh Loch. 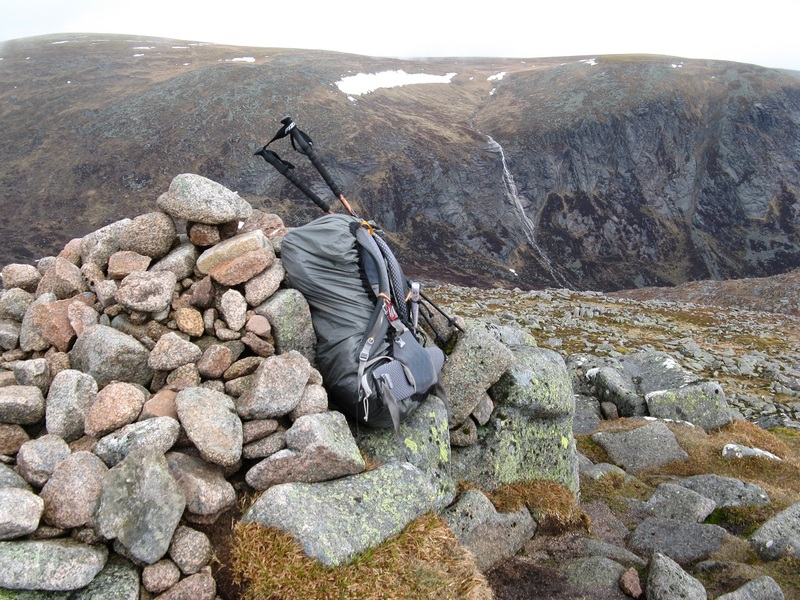 My plans were to try and make for Loch Brandy for the night, another 12 km further on from Broad Cairn. But after 6 munros, the afternoon would simply be a stroll in the park, surely. And looking at the map it all looked quite innocent enough! 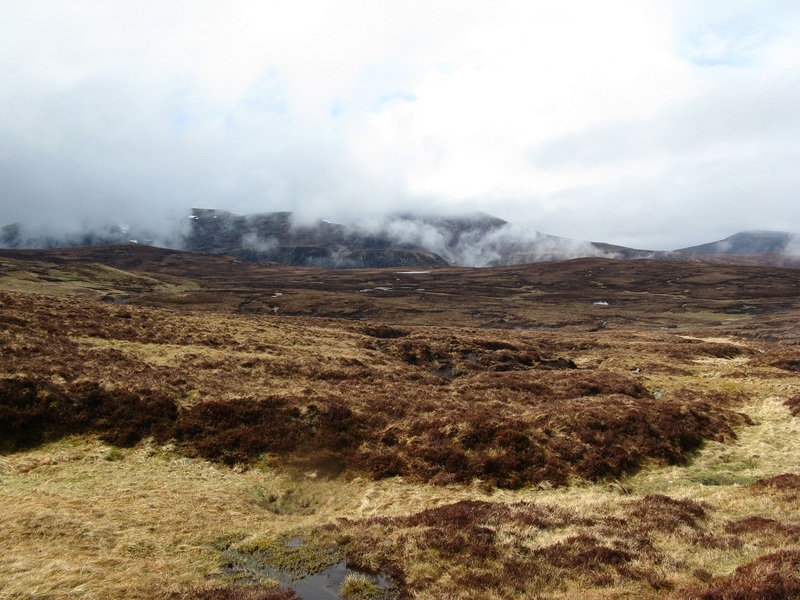 Then the snow turned to sleet, and the breeze stiffened to a moderate wind, and what had looked like easy ground on the map turned out to be 12 km of peat hags and energy sapping trackless ground. Every step of the way. In all honesty I couldn’t recommend the route from Broad cairn over Sandy Hillock, Ferrowie and Lair of Aldarie to Loch Brandy. There’s a reason Colin had said not many people come this way these days, it’s because it’s hell. 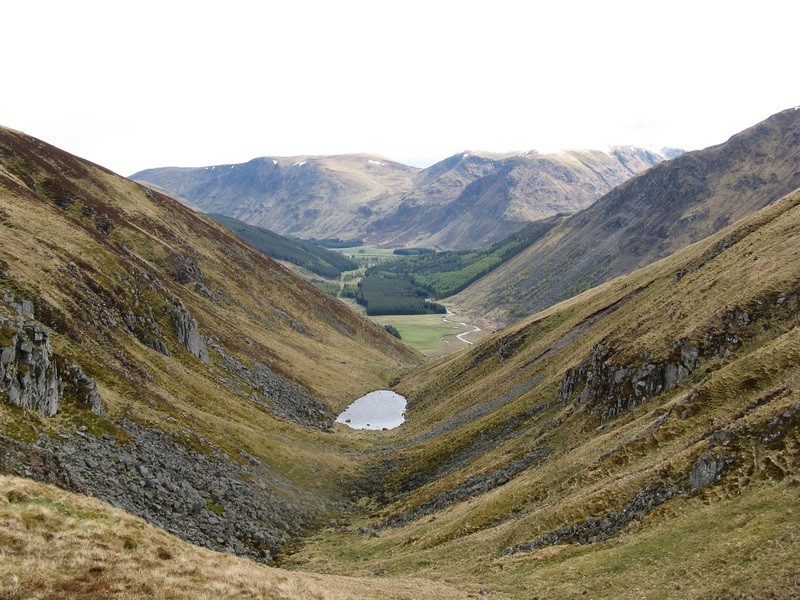 It would be far more enjoyable to just drop down into the head of Glen Doll and enjoy a beautiful stroll down into Glen Clova with the promise of a pint at the end. Don’t follow my route, you probably won’t enjoy it. Don’t get me wrong, I’m glad I did it if only to tick it off. 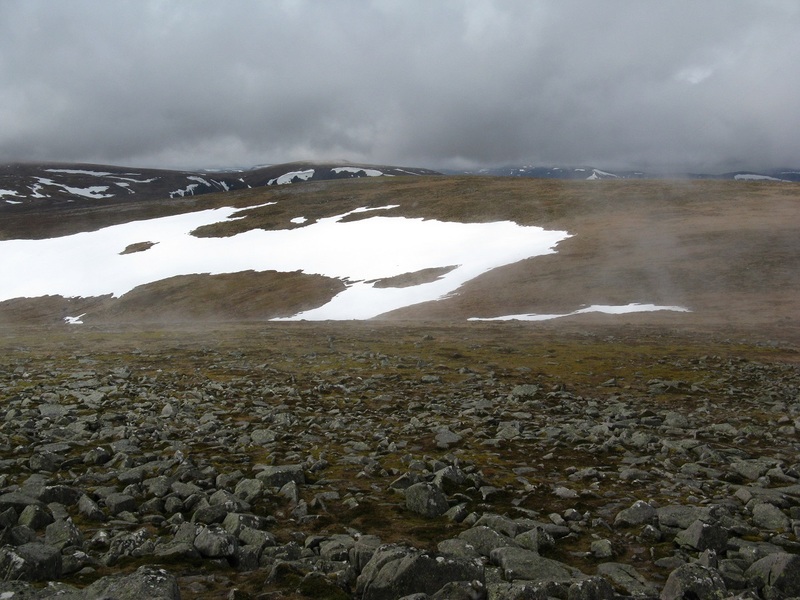 But I thought the trudge was never going to end, you can probably add a good few km onto the distance just zig-zagging around hags in a desperate effort to keep boots dry and clean. 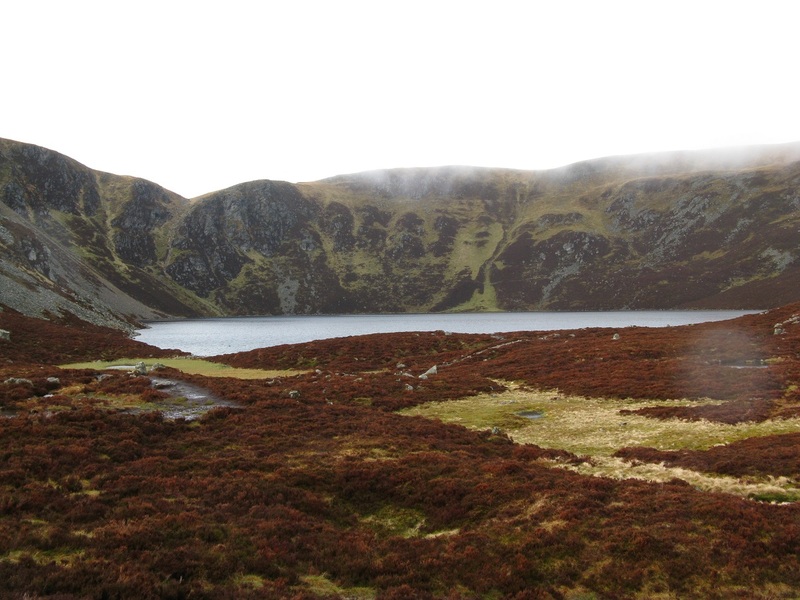 Loch Brandy itself looks idyllic if you google images if it, as though perfect pitches would surround its shore. Not so, it’s quire rough wet ground. It’s also a bit of a wind trap and the only suitable small patch of grass near the loch was exposed to some wickedly stong cold wind whipping across the water. It was a shame not to be able to spend the evening looking out at the sea birds on the loch, but I needed to find shelter and get warmed up. In the end I dropped down just a little way into a dry burn, just low enough to cut the wind out completely. The difference it made was tremendous, allowing at least some heat from the evening sun to make it’s way through. Once the sun went down however it would be another cold night, cold enough to keep me awake. Today was always planned as a short day, and I was going to leave it that way. I’d aimed to meet up with David Williams in Tarfside if our schedules crossed, though it looked like he was ahead of himself and we’d probably miss each other. After yesterdays exertions though it would still be nice to just get down, get cleaned up, eat and rest. 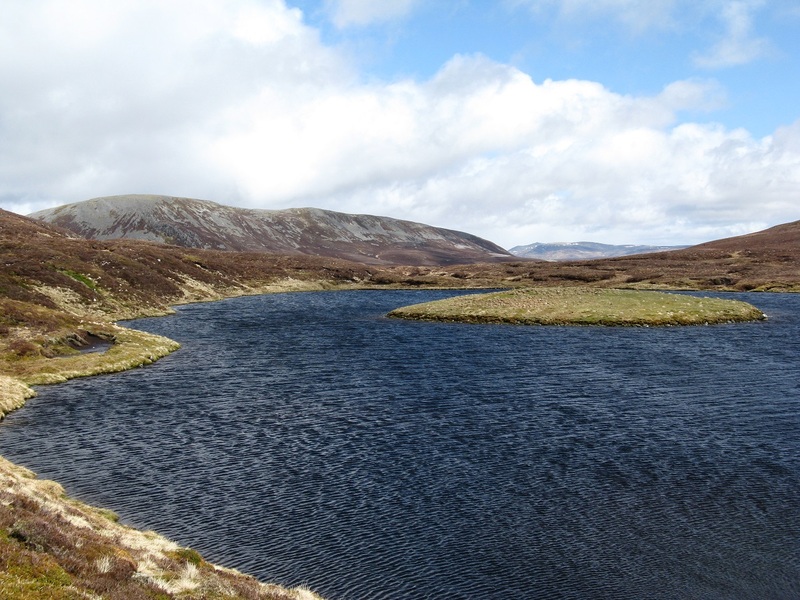 From Loch Brandy to Tarfside is an easy ramble, with a ridiculously easy Corbett along the way (Ben Tiran). Looking across from the top of the corrie surrounding the loch you could see there’d been a bit of snow dumped on Mount Keen the previous day so I guessed a fair few people would have got caught out in that. In fact snow flurries and rain were still sweeping across Mount Keen that morning, but thankfully over this side it was sunny and dry. 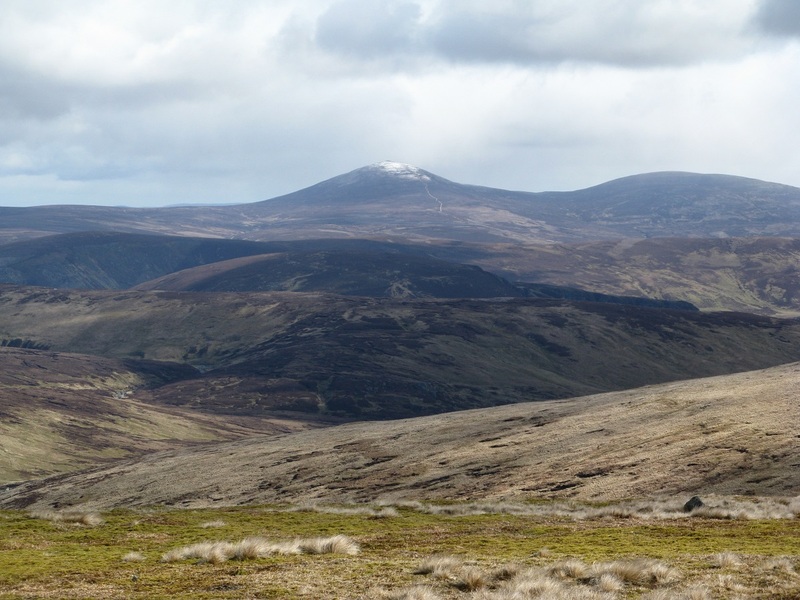 Most of the route via Ben Tirran and over Muckle Cairn, Wester Scuiley and Burnt Hill just gently rolls, though there were a few km of hags again between some of them. From the top of Ben Tirran I caught my first glimpse of the east coast, looking perceptibly close though in my case almost three days distant. Rather than the usual descent down to Loch Lee I carried on along the tops to Cairn Caidloch and dropped down to Gleneffock. From there it was only a couple of km along a quiet lane besides the river into Tarfside where I arrived at midday. All the way from Loch Brandy I’d seen rain sheeting down in the distance as I’d walked along in sunshine, then literally 200 yards from St Drostans the heavens opened and I got drenched. The deluge ceased the moment I’d stopped sprinting down the road and arrived at the door of the hostel. I think it was that short deluge that saw me immediately booking a room for the night at the hostel. After 9 days without a decent wash, some long tiring days and some cold sleepless nights, I deserved a bed. I needed a bed. I badly needed a shower. And by all accounts the hostel had been a sanctuary the previous night with challengers sleeping wall to wall to get out of the wind and sleet. In 2014 I’d changed my route from Tarfside and followed the sprint for coast via Northwater Bridge. This year I was determined to stick to the plan, with one last Corbett to take in along the way. 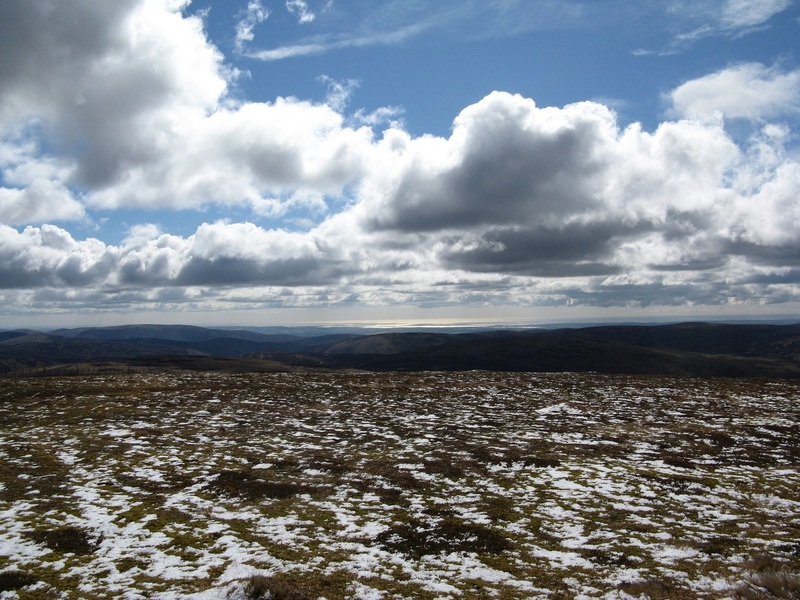 On any other sunny day the trudge out of Tarfside over Craig Soales and Moun Elen to Mount Battock would be a breeze. It’s all along good tracks with far reaching views which you can simply enjoy without the need to keep looking down at your feet for fear of tripping up. On any other sunny day! Today however the wind was blowing a proverbial hooley, getting stronger and stronger as I climbed higher. 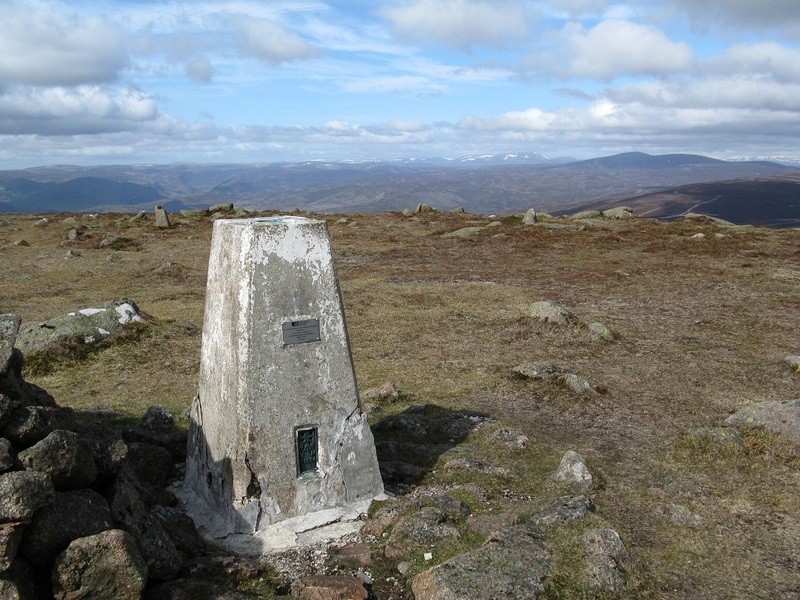 I have no idea how strong the wind was when I climbed the last little rise to the trig point on Mount Battoch, but it must have been gusting well over 60 mph, it was a struggle to stand up. In all the 13 days since leaving Lochailort, through all the rain. sleet and wind, this was the first time I’d felt really cold during the day. And this under a blue sky. It took several attempts to take a photo of myself on the last top of the walk, the wind kept blowing the camera of the rock I’d perched it on. I’ve got to say though that it felt great to be up there knowing that there were no more mountains to climb. From here I just had to head for the sea. Mount Battock….and the wind is blowing strong. I much preferred this route out to the coast to the one I followed last year via Edzell, you definitely get the feeling that your squeezing every last bit of enjoyment out of a coast to coast walk. 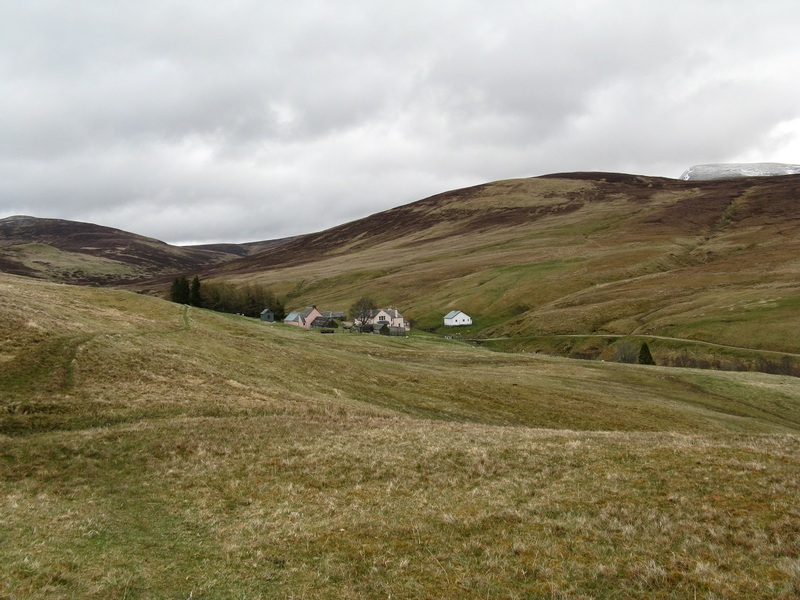 Descending from Mount Battoch along the Burn of Baddymicks into Glen Dye drops you out of the wind along a good track. You get glimpses of the wind farm in the distant Fetteresso Forest, but the surroundings retain your gaze. I’ve read some bad reports about walking out through the Fetteresso, but I have to say that I really quite enjoyed it. 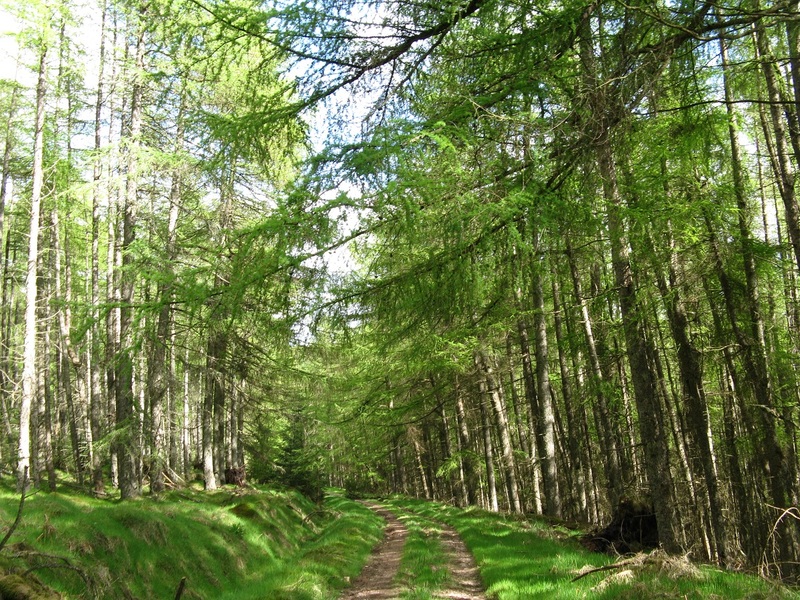 There’s a good mix of the typical spruce stands and areas of native scots pine and the route ducks and weaves from track to little path so it doesn’t feel like your usual trudge through a commercial forest. The aim today was simply see how far I could get into the Fetteresso and leave myself with a short final day to the coast. By 4 pm I’d reached where I’d hoped to get to at Cairn Kerloch but still felt fresh. I made up my last energy drink, had a brief chill in the afternoon sun and walked on a bit further. 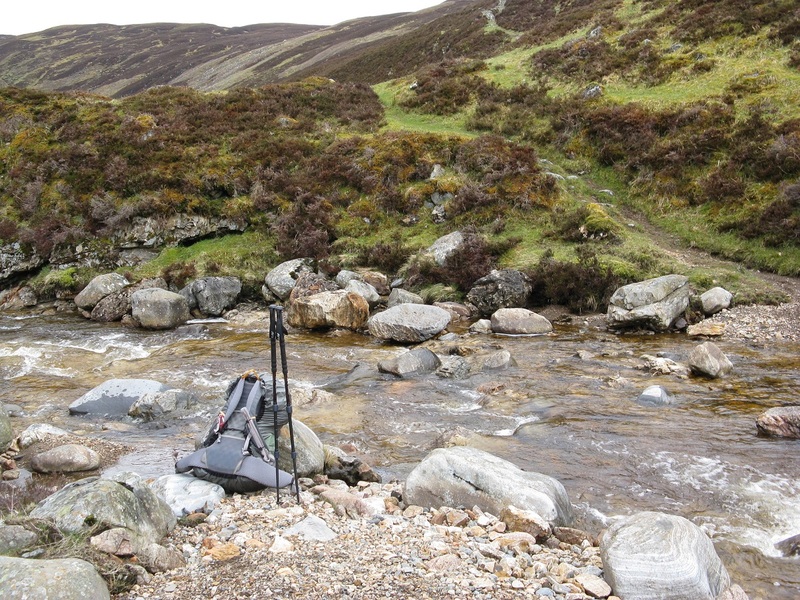 I found nice flat spot away from the track with a stream flowing past and settled down for one last night, eating the last of my rations and leaving what I judged to be one final dram of whisky to enjoy at the coast. Camped in Fetteresso Forest, only 8 km from the coast. Challengers were like a bunch of bed-wetters the next morning. I thought I was up at the crack of dawn, packed and ready for the off by 7 am. But it looked like others had got up even earlier, I just caught sight of Martin Rye and Keith Willers striding off along the track as I was wiping the nights condensation of my tent. 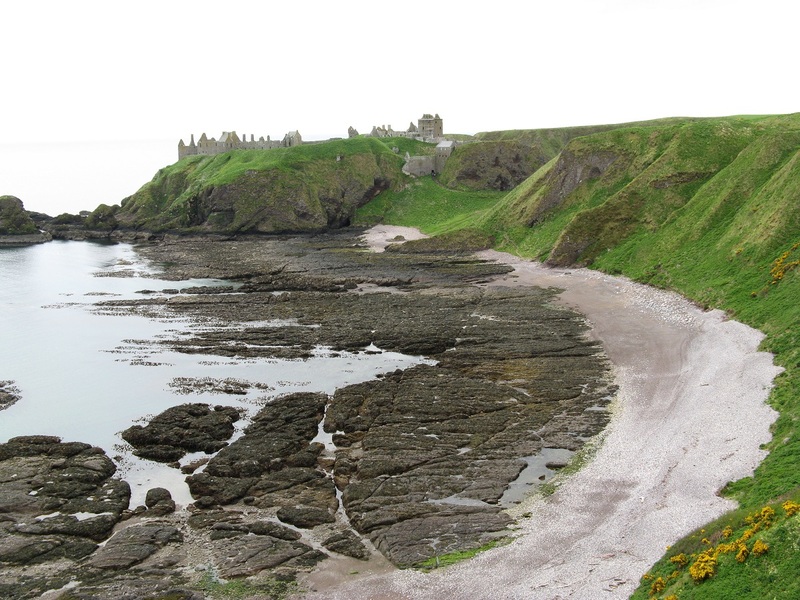 There’s probably numerous ways out of the Fetteresso towards Stonehaven or Dunnottar, but they all inevitably end with a bit or road walking. 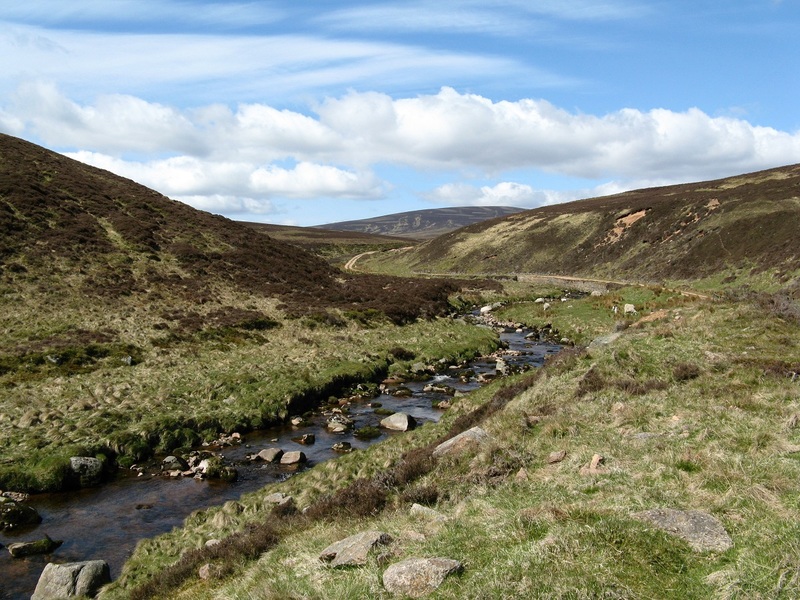 Not much though, just a few km, much less than from Northwater Bridge to St Cyrus. After catching up with Martin and Keith a bit further on I left them to walk out to Stonehaven and dropped down between Mid Hill and Elf Hill to the lane below. 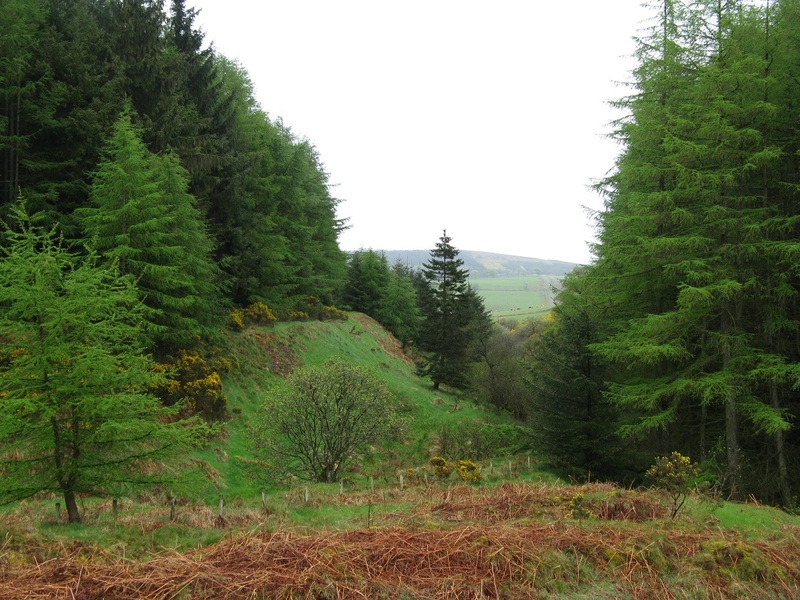 On the map this descent is shown as a good forest track, in reality it runs for a few hundred yards before disappearing in a dense thicket of gorse and brambles. The track just simply vanishes and you have to fight your way through. Perhaps not the best exit looking back. From Elfhill it’s only an hour or so to Dunnottar Castle, mostly along back lanes, though there is the A90 to cross like any other route to the coast. And what a fitting finale Dunnottar Castle makes. You don’t see it from far off, it just suddenly appears as you walk down from the car park above. I didn’t visit the castle itself, somehow that didn’t feel like it fitted in with the walk. Instead I just walked down into Castle Haven to finish as I had started, at the waters edge. You take your life in your hands trying to get your boots wet here, clambering across rocks and seaweed. It wouldn’t have been very elegant after walking 240 miles from the west coast to have fallen in. But the setting is lovely, set down in a small cove with the castle above and sea birds swooping around. For sheer atmosphere it’s got to be one of the best locations to finish a TGO walk. For the post two weeks I’d envisaged myself sitting at the end of my trek, looking out to sea, relaxing and taking it all in. Reflecting on the experience. 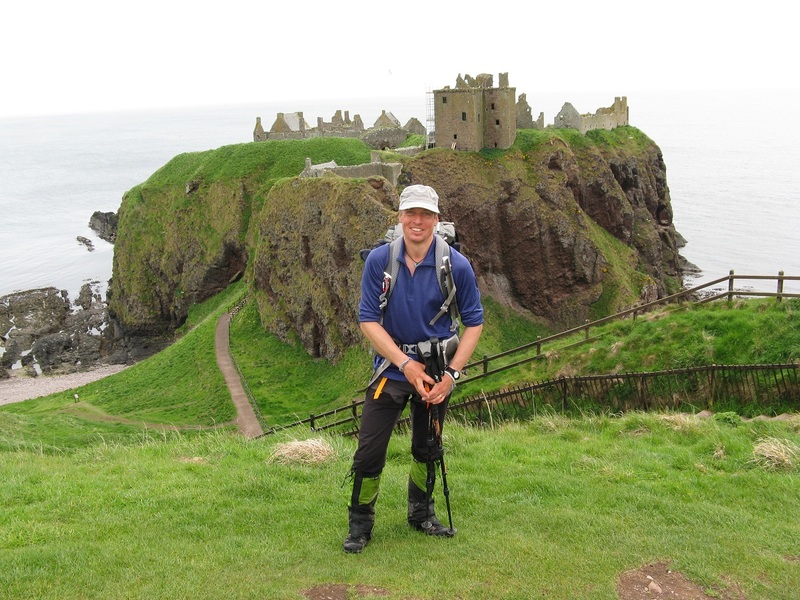 Somehow though when I reached Dunnottar Castle the walk just sort of ended itself with a full stop. That’s it, it was done, there’s really no reason to stay or hang around. Perhaps after two weeks of walking it’s just impossible to sit still. After the obligatory final photos, drinking the last sip of whisky and marking the end of the walk with pebbles on the beach, it was all over. The walk finished, and what a superb walk it had been. In all honesty possibly the best two weeks backpacking I’ve ever done. Loved every mile of it. All that was left to do was walk into Stonehaven for a celebratory pint at the Marine Hotel, the end of my trek timed to perfection with opening time. So I wandered off, slightly wobbly owing to my inability to judge the volume of a final dram. Note: It’s never a good idea to skip breakfast, drink an oversized dram of whisky, and then follow it with three pints of strong ale at the Marine Hotel. I can only apologise to the residents of Stonehaven for standing outside the Carron Fish Bar at midday stuffing fish and chips down my gullet like a drunkard. I was rather merry. Thanks Stuart, really glad you enjoyed it. 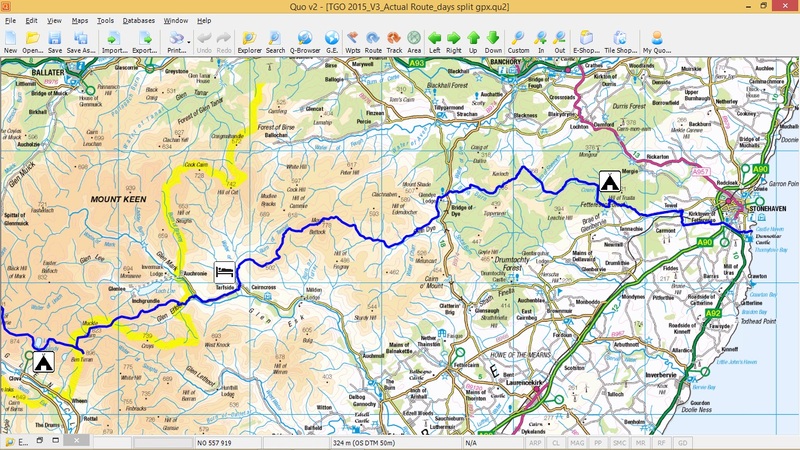 I hope there’s some ideas in there for others planning a TGO route next year. Sweeping a little further south brings you to some wonderful areas. I’ve yet to decided about next year. 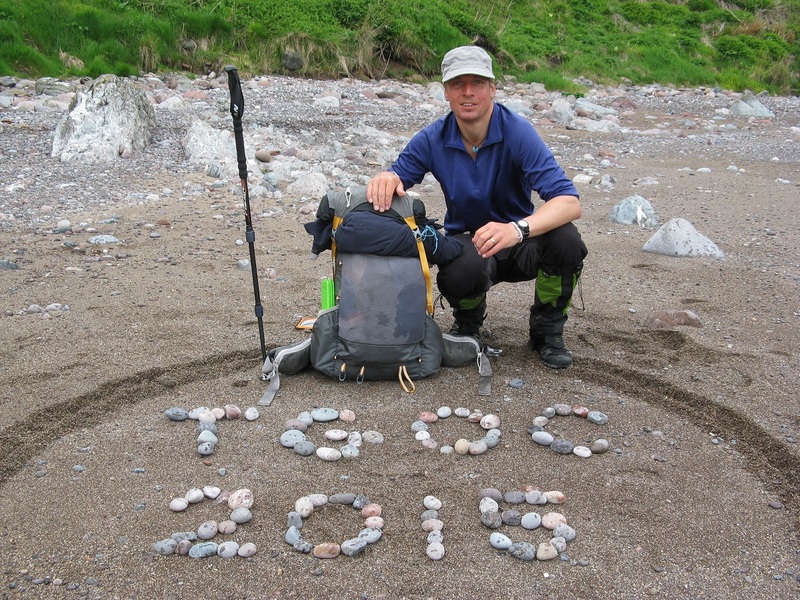 I thoroughly enjoy the TGO Challenge and quite apart from the whole community side of it, taking on planning a 200 mile backpacking route across Scotland gives me a great focus over the winter months. The planning is almost as much fun as the walking. But I have so many treks planned in my head…….let’s see where I decide to spend my spare time. Really enjoyed reading about your journey, sounded absolutely wonderful. Only found out about the TGO Challenge recently and I’m feeling a big urge to do it, even more so after reading this. I shall try my luck and enter it next year. Look forward to seeing what other adventures you go on. Definately do it. It’s a unique experience, there’s really nothing else like it. Planning you’re own route from one side of the country to the other and then walking every step of it, it becomes a very personal challenge, but lived out in the company of like minded individuals. You can’t buy adventures like that. And you wont believe how much fun you get from planning it over the winter months. Also don’t worry too much about having the right experience. The challenge is what you want to make it and you plan accordingly. The application forms ask for experience mainly so that the vetters can judge whether you’ve planned a route which meets what experience you have. Put an application in, you wont regret it.